Are you a smartphone phone user? Do you spend more time on phone than your pc? Then start thinking about mobile first and get ready to put computer in history of your mind. Facebook predicts that as smartphone use is booming, the mobile is going to take priority. Mobile World Congress going in Barcelona this week and mobile devices is hot topic. Facebook’s global head of technology and mobile strategy, Jane Schachtel predicted for mobile-first future. Schachtel predicts that due to less price of smartphone devices it is getting more and more users everyday and that`s why it is gaining more importance of in high-growth countries. New shopping solutions are on the floor. People are more likely to buy online products than going to shop. Shopping companies are tend to launch android and ios apps to provide easy shopping to their users. As many smartphones are identical and offering similar features, there is a great need for manufacturers to stand out of the crowd. Mobile Networks need to become reliable and more faster to serve huge amounts of content. It`s time for 5G networks to start springing up. Schachtel predicts to see more connected devices which connect with other devices. Schachtel says she believes a mobile-first future is good for businesses and people. 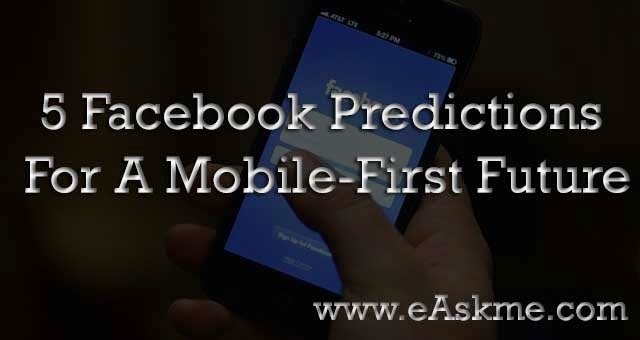 What`s your Predictions For A Mobile-First Future? If you find this article helpful, don`t forget to like us on Fb and subscribe our newsletter to get free updates.